Preheat the oven to 375°. Place an 8-by-8-inch glass baking dish on a foil-lined rimmed baking sheet. In a small saucepan, bring the pomegranate juice to a boil over moderately high heat until reduced to 1/3 cup, about 15 minutes. Pour the juice into a large bowl and fold in the apples, 3/4 cup of the sugar, 1/4 cup of the flour and 1/2 teaspoon of salt. Scrape the mixture into the baking dish. In another large bowl, whisk the remaining 2 cups of flour with the remaining 1/4 cup of sugar, the baking powder and 1/2 teaspoon of salt. Add the butter and, using a pastry cutter or 2 knives, cut the butter into the dry ingredients until the mixture resembles very coarse crumbs, with some pieces the size of small peas. Gently stir in the 1 cup of cream just to combine. Gather the topping into small clumps and scatter over the apple filling. Brush the topping with cream and sprinkle generously with sugar. Bake the cobbler for 60 to 70 minutes, or until the filling is bubbling and the topping is golden. Tent with foil if the crust browns too quickly. Let cool for 20 minutes. Serve sprinkled with pomegranate seeds and topped with vanilla ice cream. 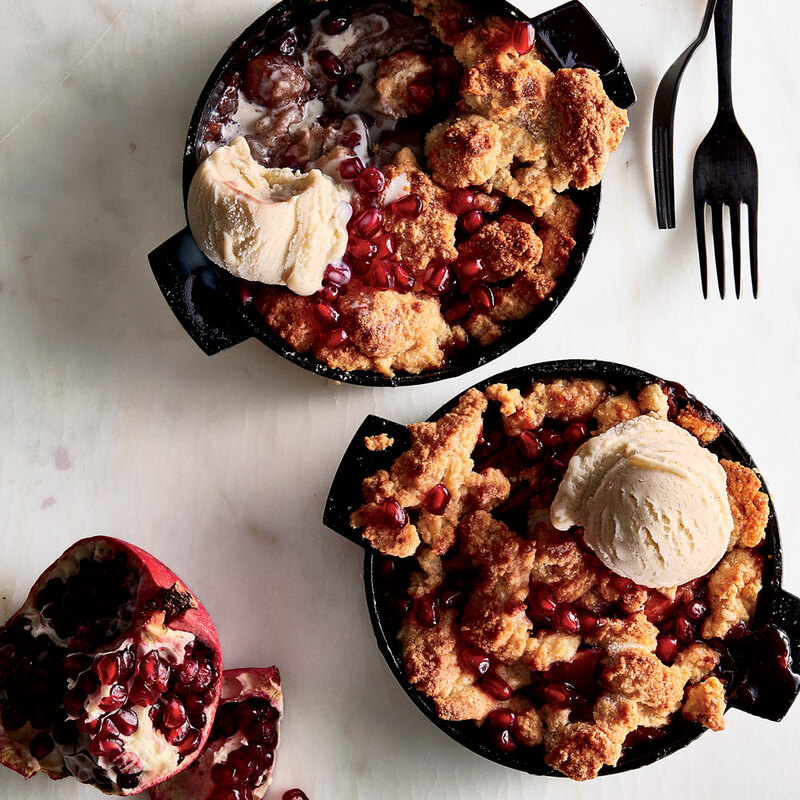 To bake the cobbler in individual portions, spoon the batter into 4 miniature skillets (2-cup capacity). Bake for 50 minutes. Review Body: This cobbler is delicious and the pomegranate reduction infuses it with such great flavor. The cobbler crust is tasty too. I did a couple of modifications: I used 1/2 cup red wine and 1 1/2 cups pomegranate juice for the reduction. It took longer to reduce than the 15 minutes mentioned but it often is like that for me in recipes. I used a mix of green apples (granny smith and gravenstein). I used 1/4 cup less sugar for the filling. I used turbinado sugar for the final sugar topping prior to baking. I served the chicken, sourdough, and bacon sheet pan entree (Oct. 2017 issue) for dinner with this as dessert! Oh man!